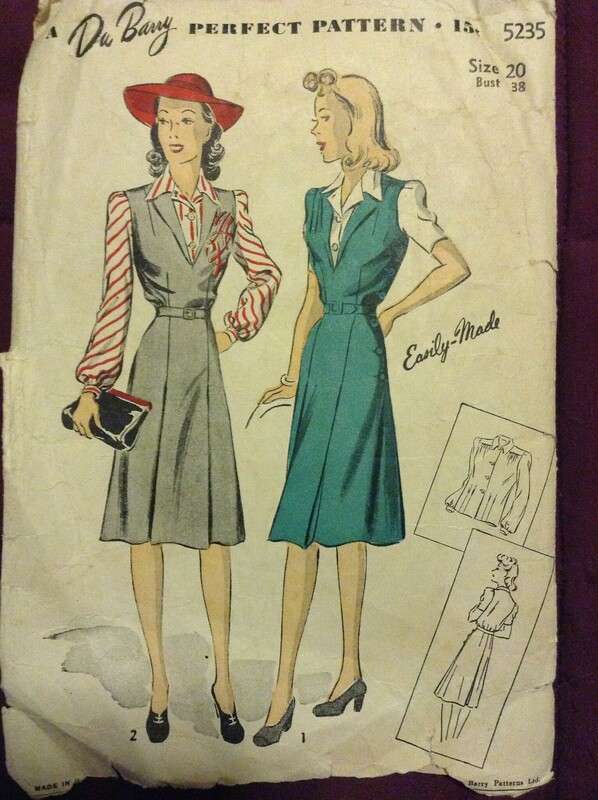 I love 1940’s jumper patterns! They look so practical (it’s a dress! it’s a vest! it’s a skirt! 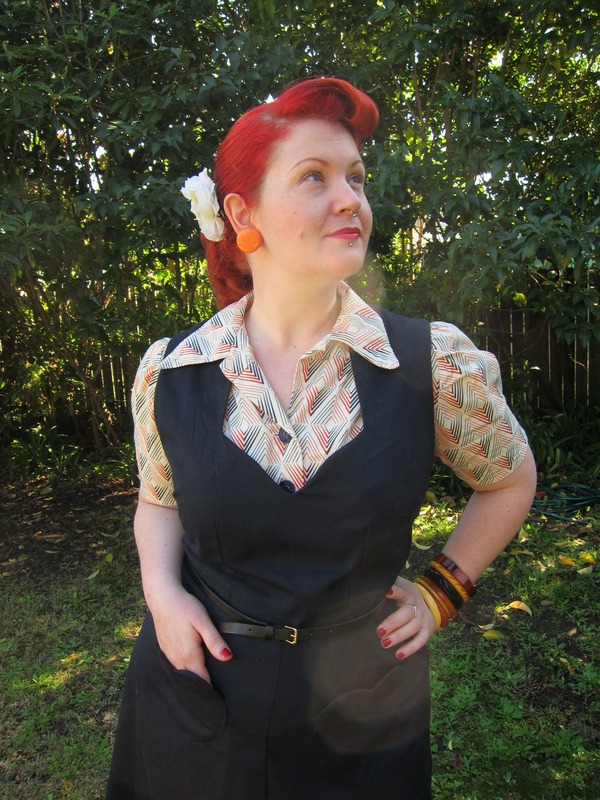 ), and I knew there was a hole in my 1940’s Wearable Wardrobe without one. Jumpers were a great transition piece for women during World War II, smart enough for office/day wear, but casual enough to wear on the weekend playing sports or in your home garden. 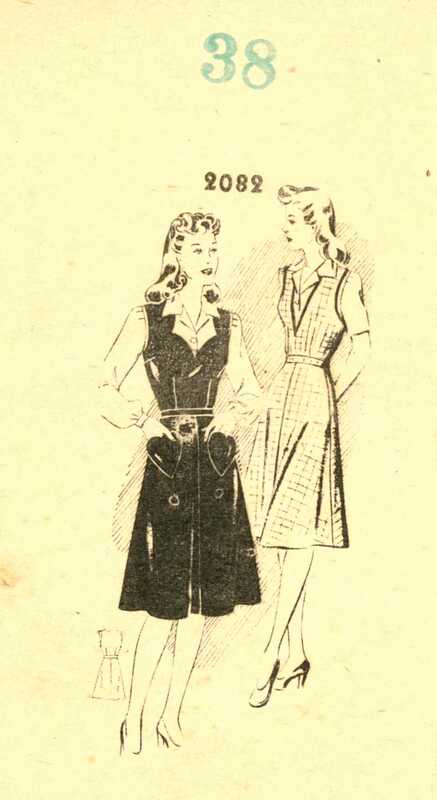 After a bit of deliberation and toiles, the pattern I ended up going with was Mail Order 2082 – the sweetheart neckline and optional heart patch pockets. 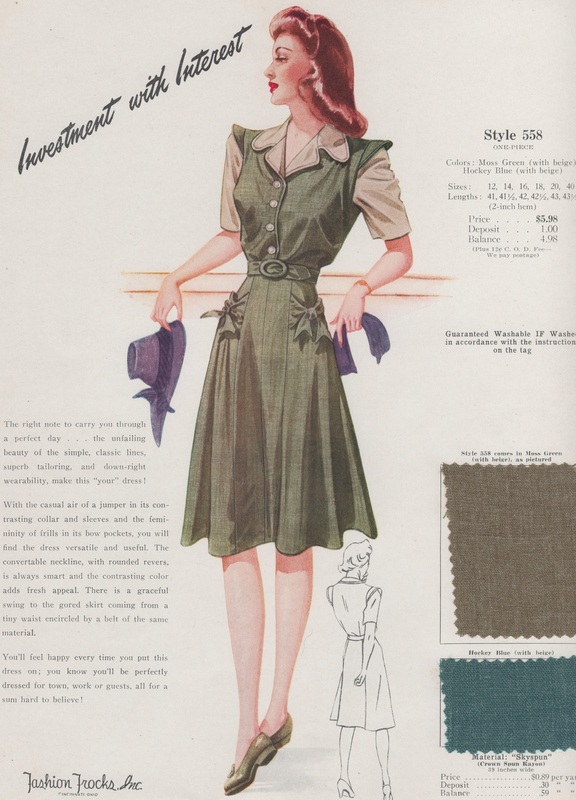 I was a little bit iffy on the sweetheart neck line and pockets – I like feminine clothes, but I was worried it might have been a bit too over the top. But actually, I love this! 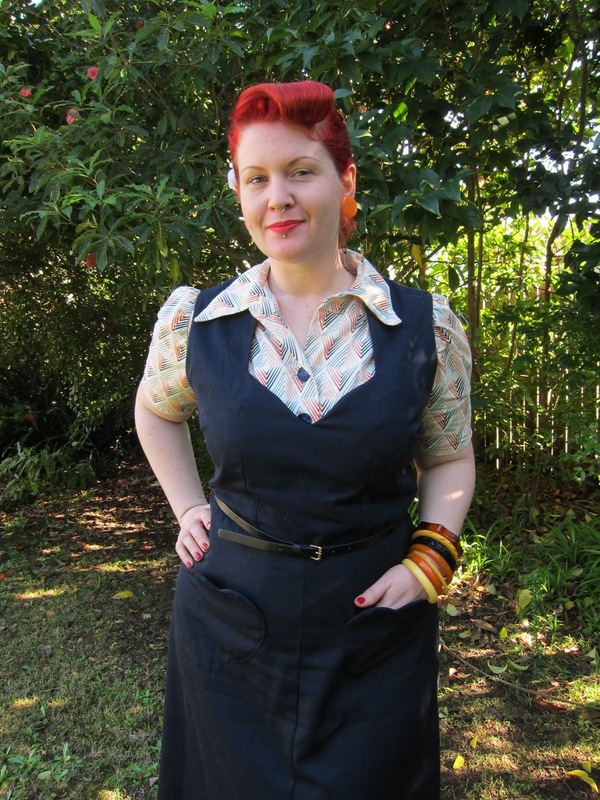 It goes with just about every 40s blouse I own – and it was a snap to make. I will definitely sew this again, i’ve already got some more gaberdine lined up in another colour (and it only takes 2.5m of fabric). – disregarded pattern instructions. I was surprised as this pattern fit me pretty much as-is! – dropped bust dart point by an inch to line up with my bust. – added an inch to each side of the front and back hips to allow for my pear shape. – proper fabric facings on the neck and arm holes instead of bias binding. 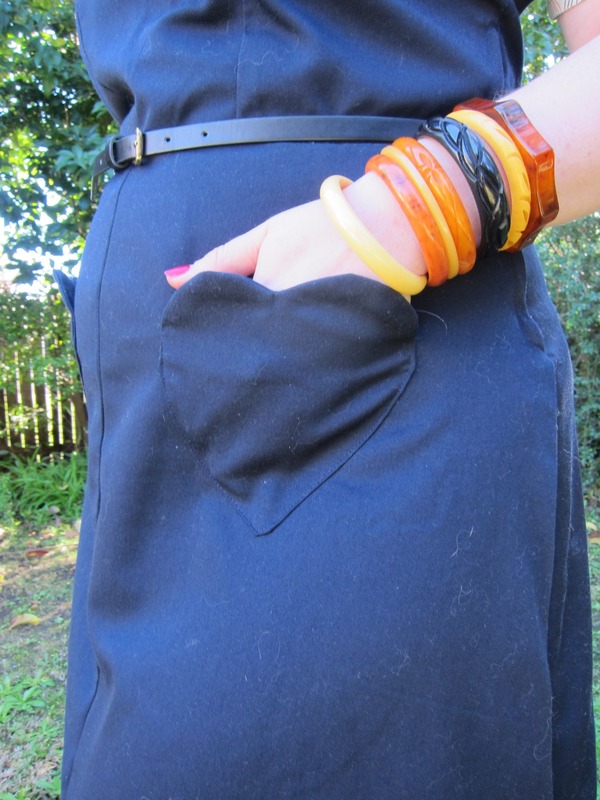 Cat hair and bakelite bangles – classy! Oops. 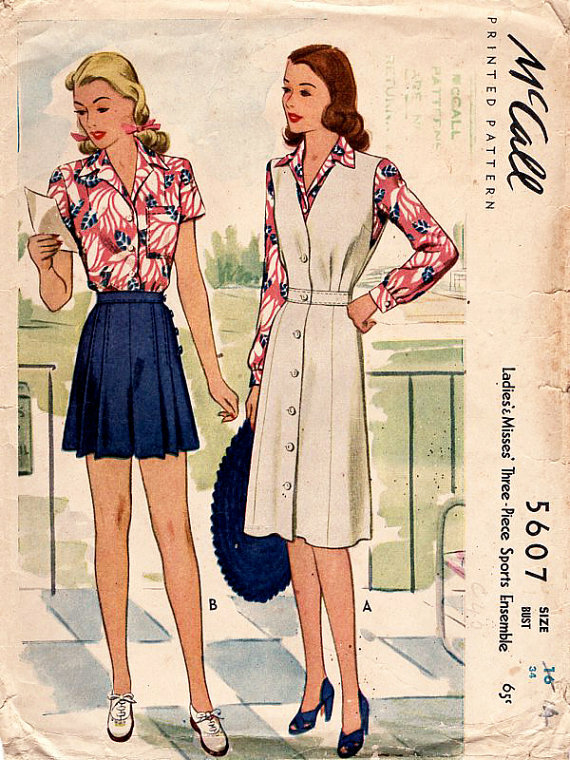 The blouse pattern is Wearing History Smooth Sailing (again) my favourite vintage shirt pattern. I’ve made this up so many times that it’s silly to keep taking photos – so trust me, if you want a great 30s/40s shirt pattern try it out. 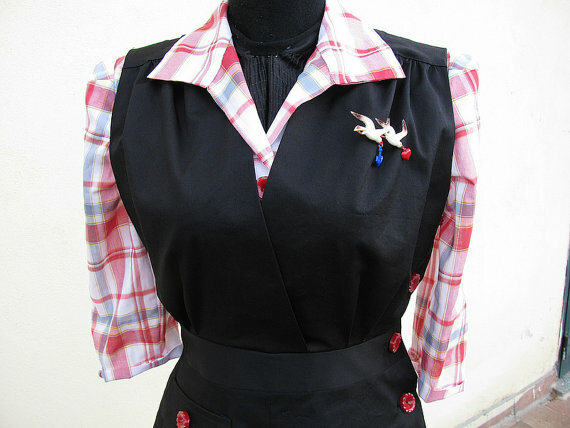 The fabric is some random quilter’s cotton that I thought looked a bit art deco, and the buttons are vintage celluloid. My only change to the pattern this time was add a tuck dart to the base of the sleeve, and remove the cuff. So what do you think – is your wardrobe missing a jumper? Previous Post FO: Beam me up Scottie! I love your new jumper. I made one in very dark denim and one in black cotton twill about 2 years ago. They are my most worn garments in my wardrobe. You look great! Beautiful bangles too. I wish I could pull a more slim fitting skirt but I am way to conscious about my belly. I've made a few A-line skirts but have hated how every one looked on me. Oh well. I guess I'll just stick to circle and gathered skirt. Holy crap! You look fabulous! That jumper looks really smart and flirty at the same time. I have discovered that I need more classy patch pockets in my wardrobe. Yes. Oh my! How gorgeous is this? And it fits you so beautifully! I love the neckline and pockets – I can see how you'd be concerned it would be a bit too feminine, but the block colour tones it down somewhat so it's almost like a surprise! The random quilting fabric looks brilliant made up. Now I wish I had bought some – I think it was at Spotlight right? 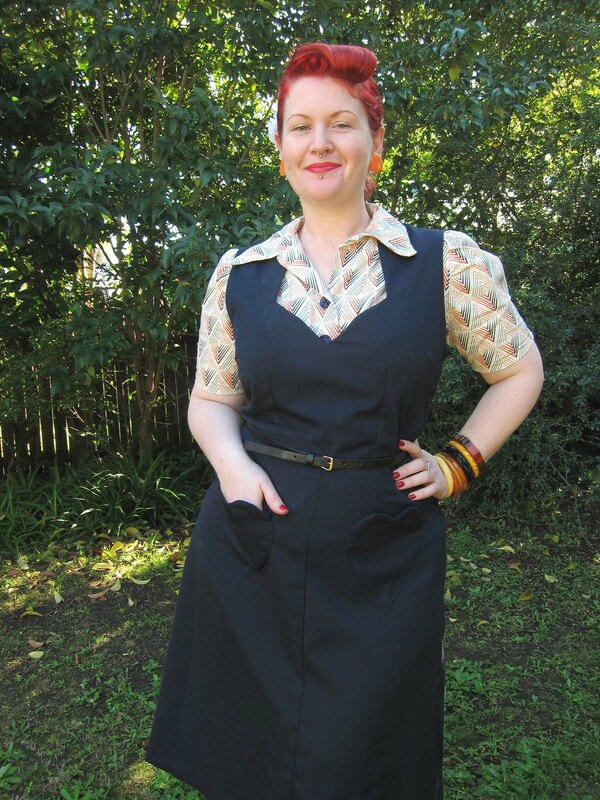 Actually I think the sweet heart neckline flatters you perfectly – what a great outfit. And thank so much for adding you to your blogroll. Love the heart pockets! I may have to incorporate these into a future project. Love it! The tough look of the dark fabric is softened by the neckline and pockets- which is what makes this jumper a winner 🙂 Nice! I love the sweetheart neckline and heart pockets! In the fabric you chose, they don't look to twee at all! The fit is great. Now I want one! Now that I have seen yours, my wardrobe is definitely missing a jumper! Thanks for the inspiration!! Seriously magnificent…oh my heart-shaped pocket loving goodness, do I adore your new jumper! I'd been looking to add a really good jumper to my closet for ages, and was finally able to pick up one from Jitterbuggin' last winter. It fast became one of my reached for garments and will be, I hope, just one of many more that come to live in my closet over the years. thanks so much for mentioning my shop.